Thank you for discovering one of the finest audio dramas available! Now available on Podiobooks.com and iTunes, as well as RSS or direct download. LISTEN TO THE PROMOTIONAL TRAILER. Journey into the creative mind of award-winning author Alicia Goranson, as she explores the nature of power and those who covet it in a genre-busting work that blends classic fifties radio drama, tense, paranoia-fueled thrillers, and the intimate knowledge born of a career working behind-the-scenes in the performing arts. Marvel at a stunning collection of award-winning stage actors, the Post-Meridian Players, as they provide the voice and heart to a cast of dozens. Follow Allen and Lewis as their ideological conflict threatens to consume their friends and family, a battle neither can yield. A bi-monthly nine-part miniseries, featuring a cast of over thirty performers. ENTIRE SERIES AVAILABLE HERE. – Right-click (MP3) to download. Download the entire Season 1 of The Mask of Inanna via our High Quality torrent – 192 Kbps. From the mind and direction of Lambda Literary Award Finalist Alicia E. Goranson, The Mask of Inanna is a mystery, horror and action-adventure show from The Post-Meridian Radio Players. 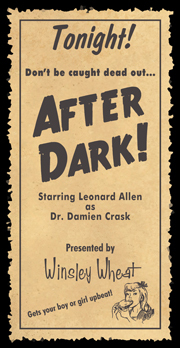 With a multi-layered dark fantasy plot with the complexity of a novel, every episode features both the contemporary story of Leonard Allen, with his alter ego Dr. Damien Crask, and a complete episode from his 1950’s horror show After Dark. Download for free using iTunes or any other RSS reader with the links to your right. It’s all one story so start at the beginning. But beware. You may want to stay in a little later tonight. Wear that pretty cross your mother gave you. Load a silver bullet in your gun. I don’t know about you, but I wouldn’t be caught dead out… After Dark! Also, please help us support our next project – click the Donate button on the right!